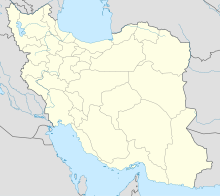 Tabas Airport (Persian: فرودگاه طبس‎ – Ferūdgāh-e Ţabas) (IATA: TCX, ICAO: OIMT) is an airport serving Tabas, a city in the South Khorasan Province of central Iran. For census purposes, it is a village in Montazeriyeh Rural District, in the Central District of Tabas County, South Khorasan Province. At the 2006 census, its population was 14, in 6 families. ^ a b Airport information for OIMT at World Aero Data. Data current as of October 2006.Source: DAFIF. ^ a b Airport information for TCX at Great Circle Mapper. Source: DAFIF (effective October 2006). ^ Tabas Airport (TCX/OIMT) - Tabas, Iran. Handbook of Business Aviation. Retrieved 16 July 2009. This Tabas County location article is a stub. You can help Wikipedia by expanding it. This page was last edited on 21 January 2018, at 13:43 (UTC).